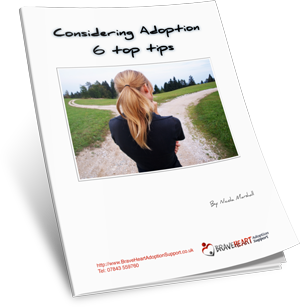 Adoption is different to parenting birth children. You need the same strength of character, perseverance and patience AND you need empathy, understanding and a huge barrel of compassion. Bravery is central to adoption. The brave hearts of these children who have many times been let down very early in their lives, the bravery to keep going, to be resilient, resourceful and to dare to trust again is amazing. Also those looking to be adoptive parents – the bravery you will need to parent in a therapeutic way is immense. There will be and are times of doubt, struggle and despair. BUT the courage to carry on means we can make a difference and help break the cycle for our children. BraveHeart aims to help adopters focus on looking after themselves so they can build resilience and strengthen all the muscles needed to be a good parent, friend and comforter to our children. Sometimes we lead them, other times we will have to walk along side them, other times we may have to let them walk a different path. All the time we need more strength, awareness and understanding of their challenges, and how those challenges impact our own feelings and actions. Fill in your name and email address below and we will send you the link to download this guide straight away.